The feature in gmail that shows a “please wait while loading” page during your inbox loads is very useful feature, especially for users who use a slow internet connection. It really helps such users to know exactly how long is it going to take for the inbox to load. As sometimes the “loading” page takes a very long time to load. Since many users have multiple gmail accounts these days, one might like to sign out into another gmail account. But there is no such option for logging out on the “loading” page. As a result of which even if a user wants to log out if he/she gets stuck on the “loading” page cannot log out. The only way for logging out when a user gets stuck at the “loading” page is to clear all cookies and restart the browser. 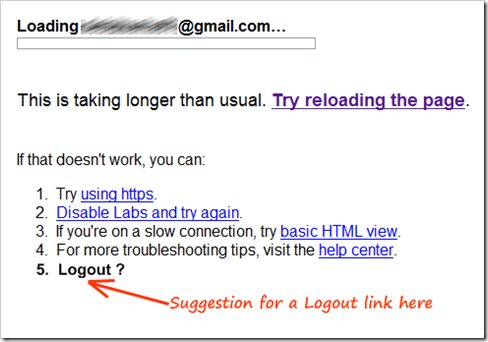 So it will be really useful if the Gmail team puts up a link to logout right on the “loading” page itself. I hope the GMail team is listening.